Game Warden's Great Speckled Trout catch. Guided by Captain John Little they enjoyed an awesome day on the water. Today seemed to be a good day to visit the Land Cut since 20 mile an hour winds were predicted and last night was a full moon. We decided to take my new Blazer Bay south to the Land Cut for its first big trip. She cut through the 2' to 3' swells on the way down and found softer waters at the Land Cut. Though the wind was still strong there was enough land cover to fish the area. Even after anchoring up the wind caused us to loose our position a few times. 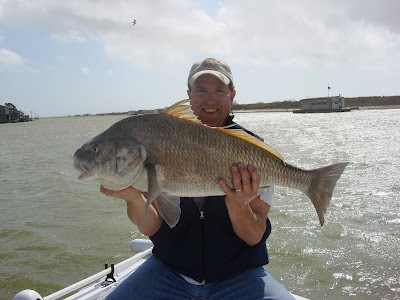 We managed to catch several under sized redfish and several drum in the area. I was able to catch a personal record 34" Black Drum and release it after a good fight. 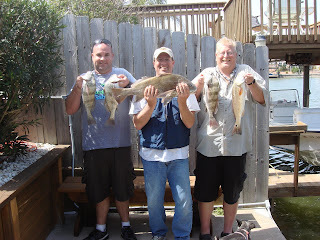 Pictured above is Josh, Me, and Tracy where we caught several Black Drum and a Red for the grill later. 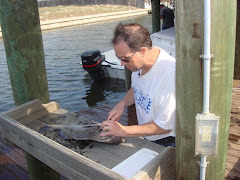 We used live shrimp from Bluffs Landing for a fun day on the water. February 28th, 2009. This tournament began with 30 to 40 mile an hour winds as a Northern cold front moved in about 7:30am. Several kayakers never got their boats in the water due to these horrible weather conditions. 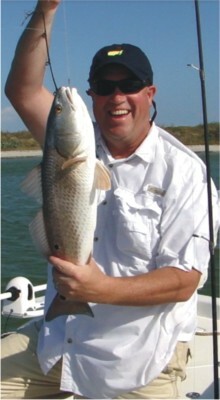 Jerry B made a night before ruling that allowed for wade fishing for those choosing to keep their boat dry. 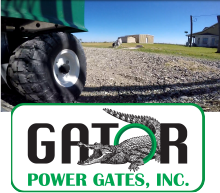 Also allowed an earlier start time to allow for fishing areas outside the Baffin Bay Area.